This is a classy recital of Sibelius's music for solo piano but is this, as claimed, a case of "the symphonic master's hidden piano gems"? Gems? Up to a very modest point, but hidden or secret? Not really, except that the piano music, rather like most of the chamber music and songs, has been overshadowed by the orchestral works. It has had comparatively few recordings and for the general music-lover probably will come as a surprise. Sibelians will know it from complete surveys by Servadei (Alto), Gimse (Naxos) and most notably Folke Gräsbeck (Bis) across two volumes of the composer's Bis Edition (vol. 1 vol. 2). Add to these some isolated discs, including those from Heinonen (Warner) and Gräsbeck. The longest-lived in this category is the LP that came from Glenn Gould (1932-82) in 1977 on CBS-Sony. Gould was a controversial artist whose death occurred some 35 years ago. That disc is very much worth mentioning although it presented us with only 35 minutes of music: the three Sonatines op. 67 and Kyllikki op. 41. Sibelius's instrument was the violin and not the piano. There is no piano concerto. My impression is that his extensive piano solo production catered to the financially rewarding demands of his publishers, Bretikopf, rather than being an expression of a compulsion to compose 'high art' for eternity. It is intriguing because the flow of piano solos continued after Sibelius's orchestral production ceased in the 1920s. The famed Sibelius can be heard in the Valse Triste as arranged by the composer from the orchestral score. It gave access to the Sibelius experience for home pianists. Even this, heard in this format, ends up smacking of the salon. The 'authentic' Sibelius can be heard on this disc. It is glimpsed in the Romance op. 24, with its fragmentary quote of the big tune from Finlandia, and in the glum, steady-pulsed Barcarola. By and large Andsnes - who has a longstanding track-record with Scandinavian composers - picks and chooses from the various suites except in the case of Kyllikki, the Sonatina and the Five Esquisses. Kyllikki has the right title as this was the name of one of Lemminkäinen's conquests on Saari according to the Kalevala, Finland's national epic. However, its three movements are playful and if they come within sight of Sibelius the master it is through his lighter playful side; more Karelia Suite and the theatre music, rather than the Four Lemminkäinen Legends. The same can be said, for example, of The Shepherd, Rondino, Humorous March and Esquisse No. 4. The first movement of Kyllikki has its stormy Rachmaninov moments while the very appealing central Andantino occasionally comes close to The Song of the Volga Boatmen. The two Impromptus and the Elegiaco are most beautifully done with Andsnes's lightness of touch much in evidence, but what we hear is more Grieg with a moist-eyed dash of sentimentality than anything else. The Sonatina No. 1, even with its swirling arpeggiation, is a thing of tinselly glitter. So much of this material, while charming, does not get much further than the shallows occupied by his late orchestral suites, as recorded by Charles Groves. My hopes were always high that the suite The Trees op. 75 would be something special but despite the tree titles there's little to mark the two pieces chosen by Andsnes as special or anything beyond charming. The good-looking booklet has fairly extensive and reflective notes by Andrew Mellor. These are helpful and feature the occasional quote from the composer and others. They are in English, German and French. It's all well done but can we have less of the hyperbole? There's a quote from Andsnes across pages 3 and 4 in huge block capitals that for my money over-eggs the mix "It inhabits a private world; it is almost not for the public, but something to play for a friend or even alone." Not that this treatment is uncommon but let's have less of the glorification of the artist above the composer. The disc is labelled with the pianist’s name above that of the composer. On second thoughts, this is less objectionable given these by and large modest musical works. 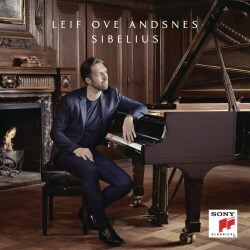 Andsnes gives of his very considerable best, as do the Sony engineers and this is the place to go for a single disc selection of Sibelius the piano composer.